Last month, I received an unexpected–and most welcome–package: a copy of Fred Osterman’s Shortwave Receivers Past & Present, now in its fourth edition. My copy was a signed version, sent to those who contributed to the volume. Although my contributions to this impressive and highly comprehensive work are quite modest, I was grateful nonetheless; author Fred Osterman is not only a good friend, but a radio mentor. He’s also a supporter of my non-profit, Ears To Our World (ETOW); indeed, without his warm encouragement, I doubt I would have launched that enterprise so successfully. Fred continues to support ETOW in innumerable ways. And more than anyone else I know, Fred is a guru of all that is shortwave radio. As the president of Universal Radio, he has the good fortune of seeing a number of new/used radios appear on his doorstep every day, many of which are quite rare. In short, Fred Osterman knows his stuff. But what a pleasure, to be able to recommend whole-heartedly this book, not because my long-time mentor penned it, but because it is…well, good. Really good. The first time I opened Shortwave Receivers Past & Present, I couldn’t put it down for nearly an hour. The book is logically laid out by manufacturer and model; each section devoted to a particular model and all of its iterations are noted. As you can see in the example above, in-depth information including the author’s comments are provided, as well as the vitals on each rig–features, specifications, internal components, accessories, readout type, physical dimensions, review notes, current pricing–all beautifully and clearly presented. Clear black-and-white pictures of the radios as well as manufacturer logos are also shown. While one can, of course, research radios online, rarely can you find all the information you seek so complete; this book has done all the painstaking work for you, and made it infinitely more convenient. Secondly, Shortwave Receivers is a quality publication. Back in the 1990s, I had the good fortune to work in university archives for a period of time; since then, I notice things others might overlook–binding, paper, quality of print. This book feels like the archival volume it is, with heavy, glossy pages, a robust binding and sturdy spine. It feels like one of those heavy encyclopedias you might have found in libraries in the past, created to endure many page turns and, indeed, stand the test of time. As heavy as this book is–and it is very heavy, I admit–I think I might start carrying it to hamfests, especially to those with antique radios (i.e. “boat anchors”) on offer. With this work in tow, not only could I determine, on the spot, if a particular model of radio is a bargain, but also tell at a glance if it’s rare, if the components can be sourced readily, and anything else noteworthy I really ought to know about it. This would give me a leg up when bargaining, not to mention, make the whole radio experience more fun. Indeed, if you collect or restore vintage shortwave receivers, or dream of doing so, this book is an absolute must. That’s the power of a proper reference book with an author who is as passionate about these receivers as the readers. In short: I highly recommend Shortwave Receivers Past and Present. At $49.95 US, it’s pricier than most individual books; however, considering its role as an all-in-one encyclopedic reference, it’s a value that will serve you for decades. But if you do obtain a copy of Shortwave Receivers, I leave you with a warning: if you’re like me, you may find it just about impossible to put this book down. 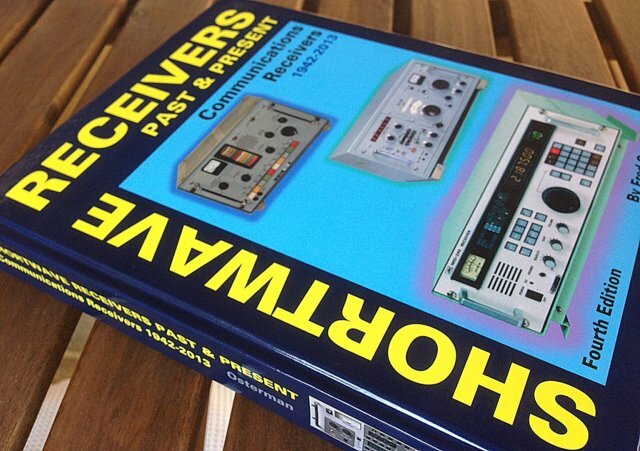 Purchase Shortwave Receivers Past and Present, Fourth Edition at Universal Radio. This entry was posted in Boat Anchors, Books, New Products, News, Radios, Shortwave Radio and tagged Antique Shortwave Radios, Book Reviews, Fred Osterman, Shortwave Receivers Past & Present, Universal Radio, Used Shortwave Radio Buyers Guide, Vintage Radio on December 15, 2014 by Thomas. Very interesting book. I would not mind to pay 49.95 bucks for it, but another 50 for shipping? It would be great to read this book in electronic format, epub, pfd, you name it. I think this way it would find its way to all the radiomaniacs (including me) all over the planet. 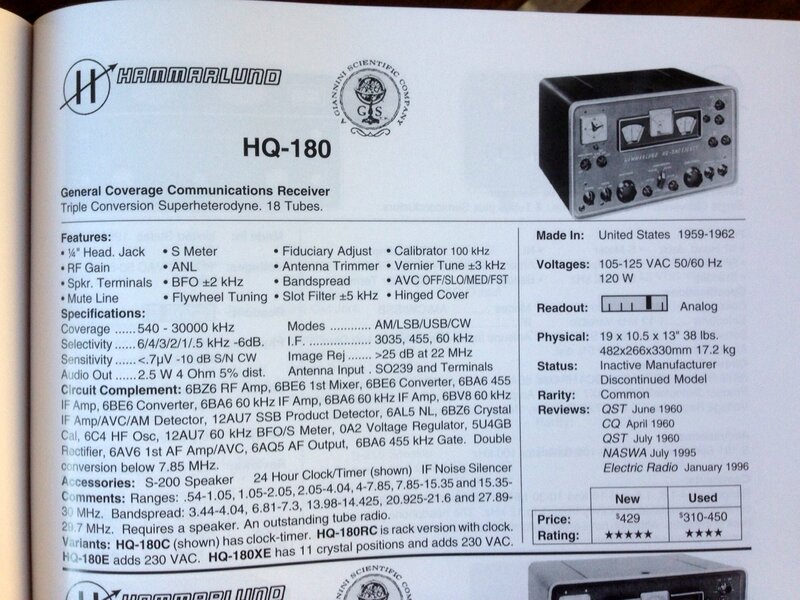 Fred’s latest book, and it’s a mega-accomplishment, is obviously THE source for information about shortwave receivers. It’s definitely a book to have on your shelf and will make for many hours of enjoyable reading.